Campers need to drive slowly for the safety of other campers on foot and wildlife around. 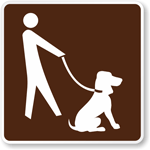 Place one of these speed limit signs in your campground and discourage speedy rides. Make sure recreational and cultural interest areas are safe from rash and uncontrolled drivers. Tough signs are built to withstand harsh weather conditions, chemical spills, fading and more. Click on any of the designs below for a quick view of price and features. 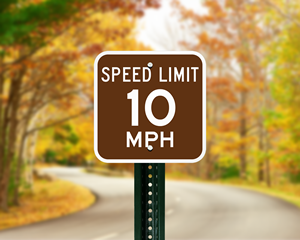 • Speed Limit Signs are fully compliant with MUTCD design regulations. • Square signs have rounded corners to prevent fraying and mounting holes for hassle-free installation.